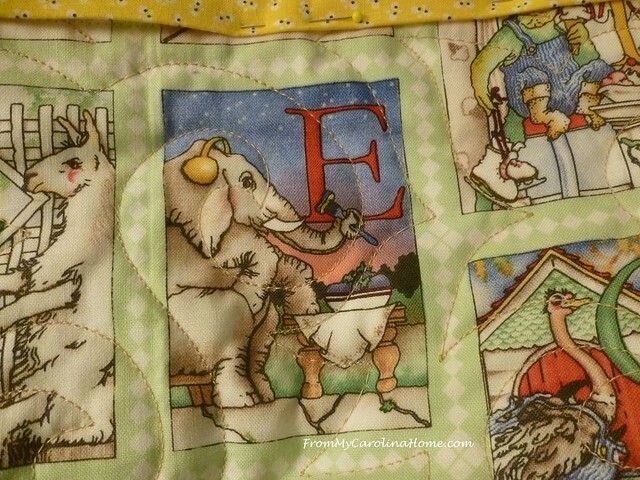 Remember the Hungry Animals Alphabet fabric? I still had just a little bit left from a gift sent to me by a reader. 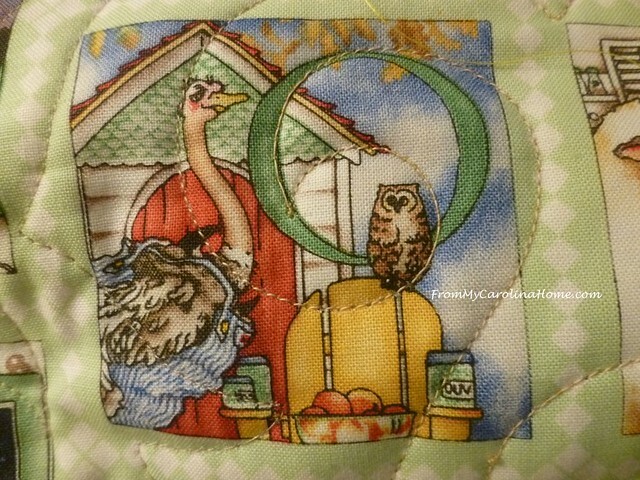 I wanted to do a lullaby quilt for entry in the fair, so it seemed the right time to use up the last of it. 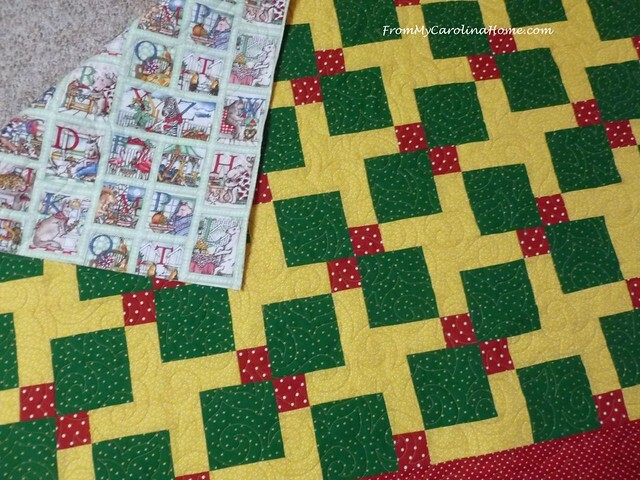 I picked bright colors from the print for a quick Disappearing Nine Patch quilt. 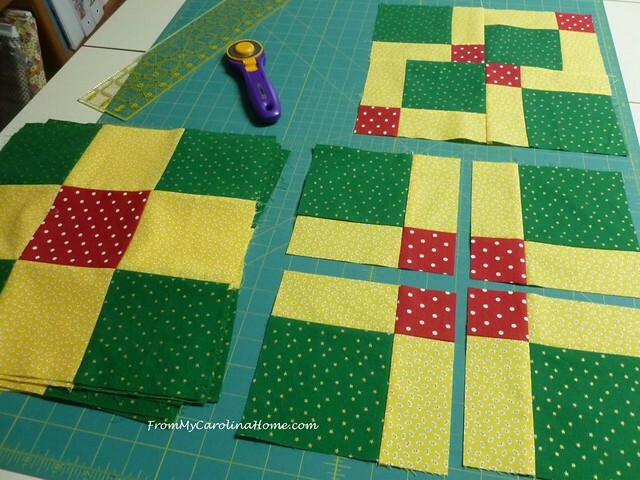 You know how to do this, make nine patches, cut them into four sections, then turn two opposite corners to move two small squares to the corners. 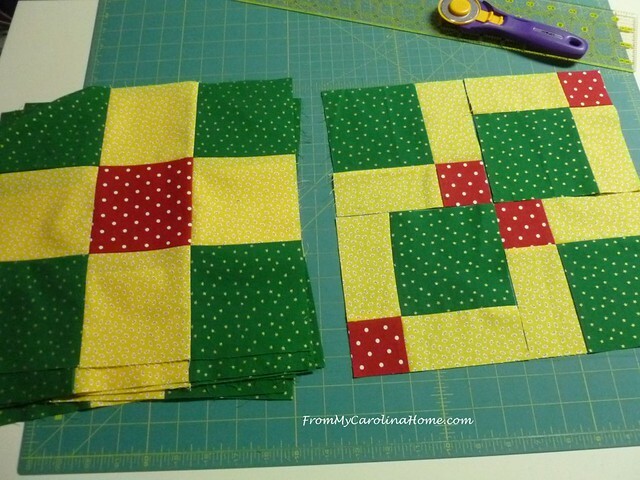 I did this chain piecing style, cutting all at once and stacking the blocks. 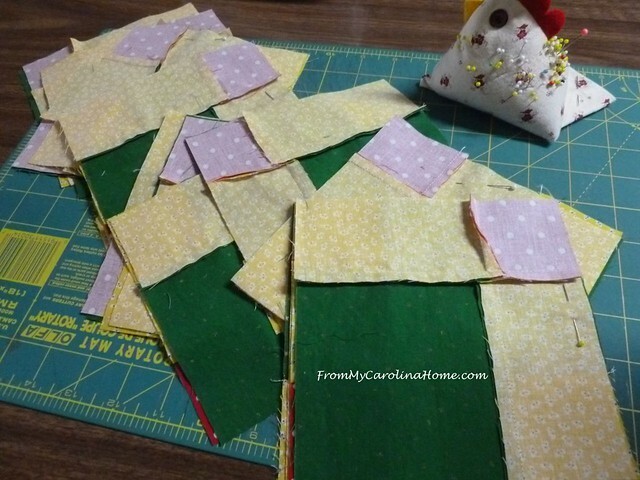 In just a couple of hours, I had a quilt top. 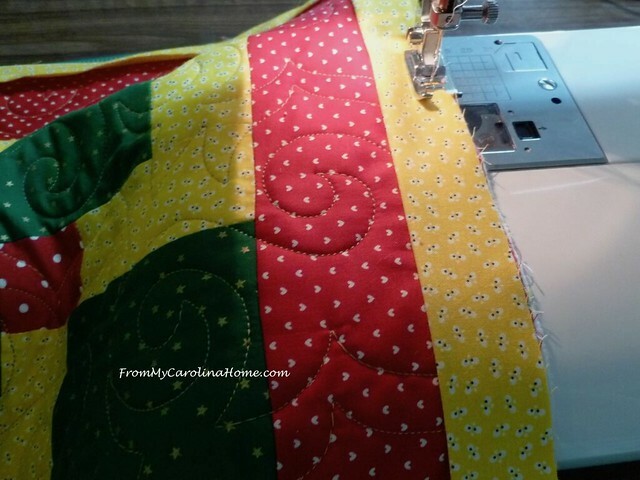 I added a red dotted border, and loaded it on the longarm. I used a golden yellow King Tut thread on top, and a neutral light brown Bottom Line in the bobbin. The yellow thread looks good on all three colors on the top. Cute and done, with the Hungry Animals on the back. I decided to bind it in the same yellow print, and sewed that onto the front. 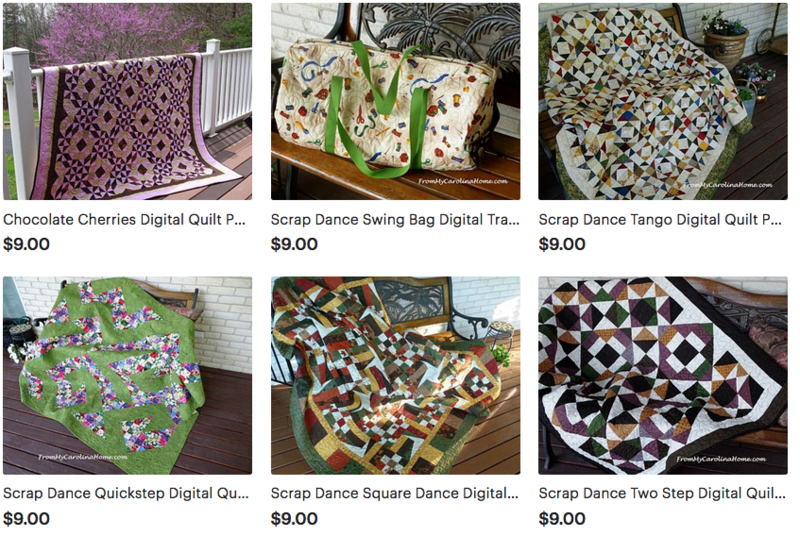 I do enjoy this kind of handwork, and worked on the whip stitches over the next few days. I did get distracted by this print again, LOL!! The Vultures have Umbrellas and Vegetables in the U-V block. Are they sitting on a veranda? An Ostrich and an Owl have Oranges and Olives. Is that an Outhouse? 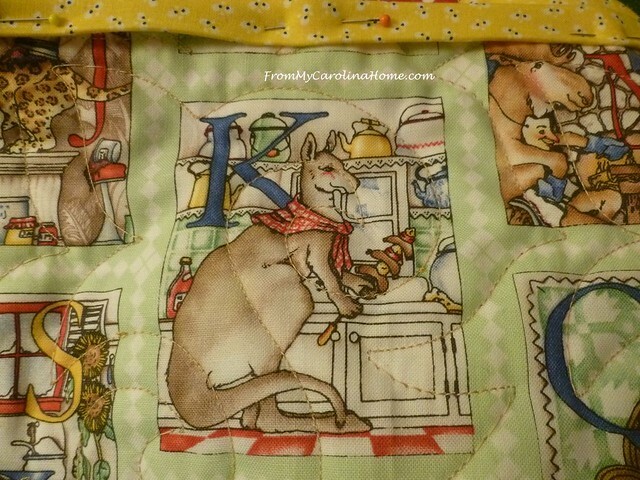 A Kangaroo eats Kabobs in a Kitchen. What else can you see in this K block? An Elephant wearing Earphones eats Eggplant in the Evening. 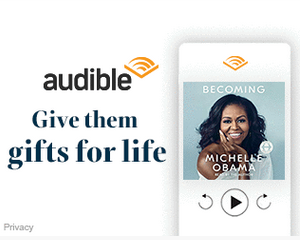 Do you see any other E words? Extra credit if you can name these animals without going to the internet to look them up. Hint – our friends in Australia may have an advantage. 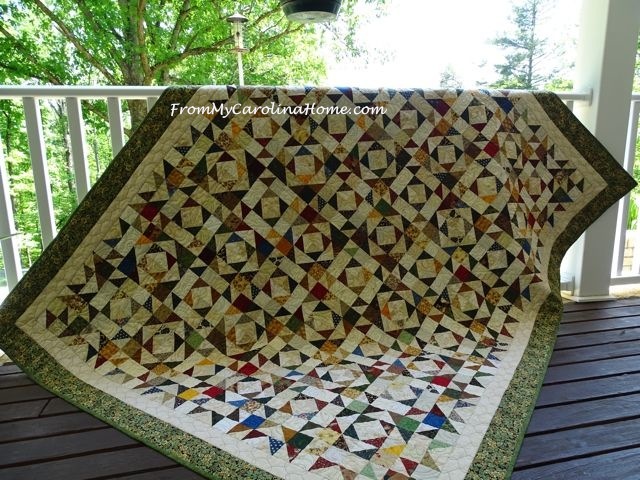 Finally, back to the finished quilt! It is done. I entered it into the fair in the lullaby category. It is fun to see it hanging at the fair. I think a child will have a ball with this. I think I may need one for myself, LOL!! 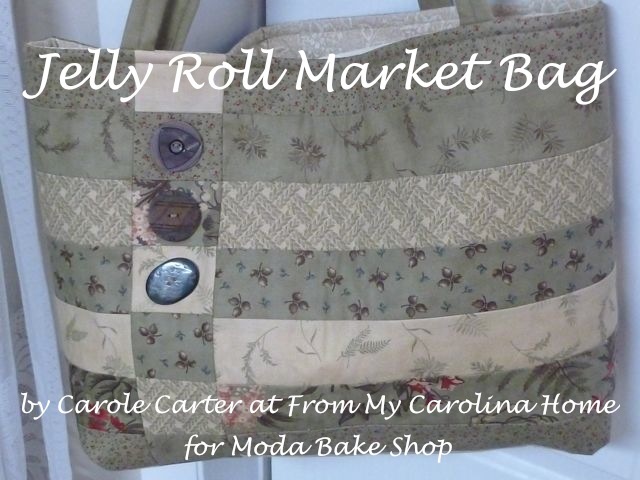 I’ll be delivering it to the Blue Ridge Humane Society after the fair for their upcoming Silent Auction. I thought the Hungry Animals were perfect for this venue. I hope it does well at the auction. from picture, other K words – kettle and ketchup. The D9P is always a winner. I love that backing fabric. It’s a beautiful quilt. I hope it raises plenty of money in the Silent Auction. I love the dual interest you’ve given it, putting the animals on the back. Some little toddler is going to really enjoy this! 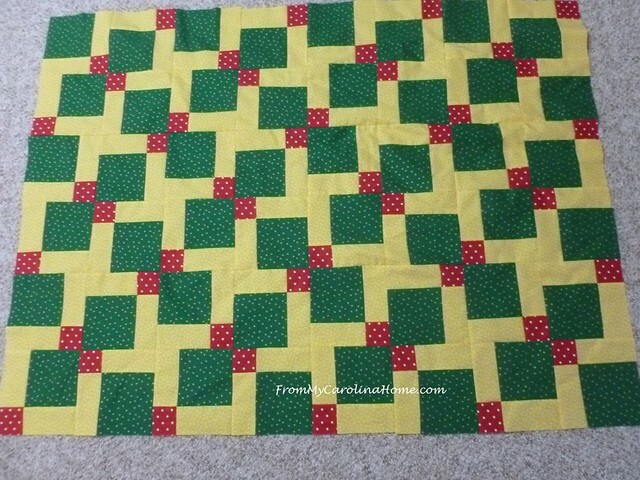 This is a very cute quilt. I like your setting for the disappearing 9 patch. My only attempt at a D9P was rather haphazard when I put it together. 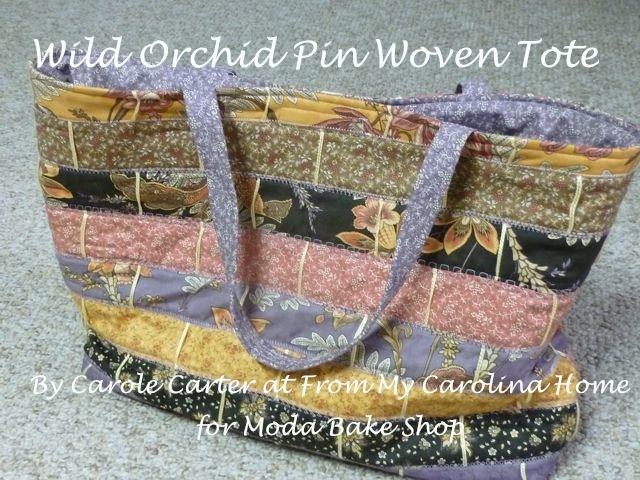 I had not seen this fabric – it is adorable! 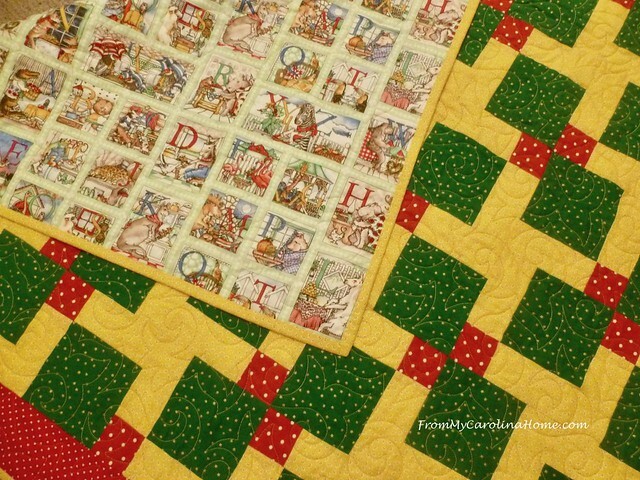 Great quilt and I am really glad you didn’t chop up the alphabet fabric. When I read disappearing nine patch I thought you were including the animals in the nine patch. It is perfect left whole like this! Fun way to enjoy that animal fabric! I love seeing all those images. 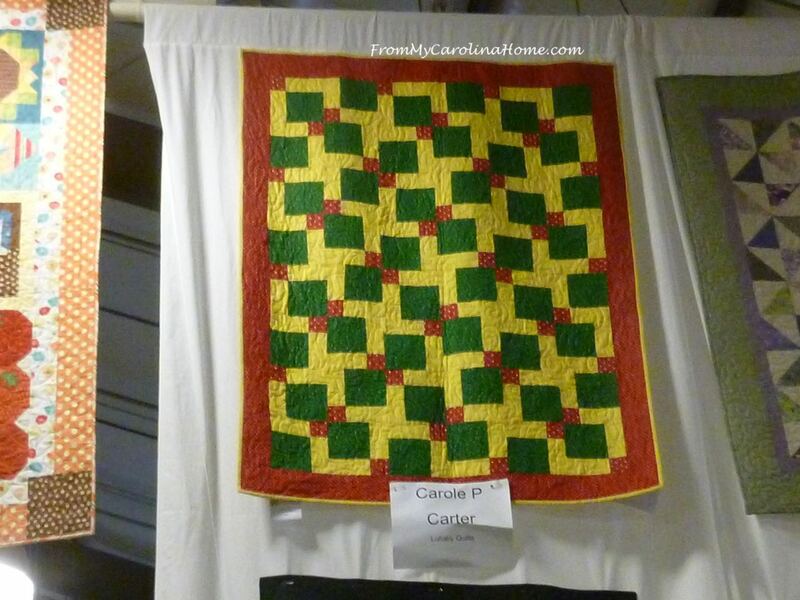 Hello Carole; This quilt is adorable! 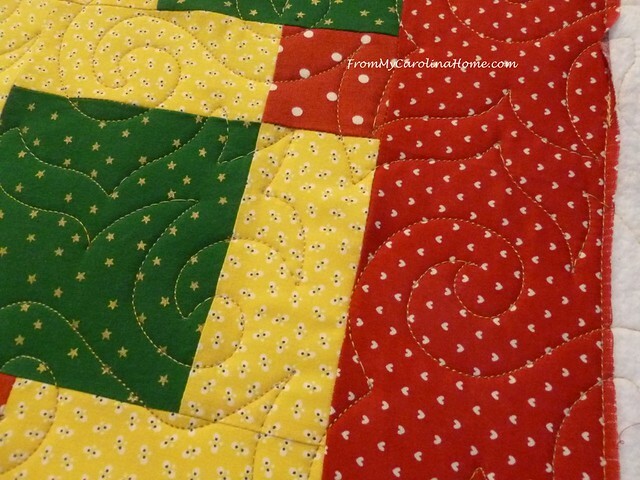 Your fabric choices for D9P are excellent and just make the front of the quilt so pretty. 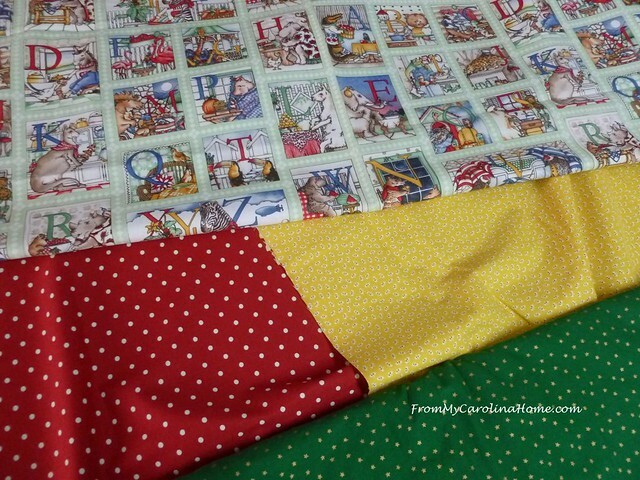 Leaving the extra special fabric whole and using it as the backing fabric was a great choice also. 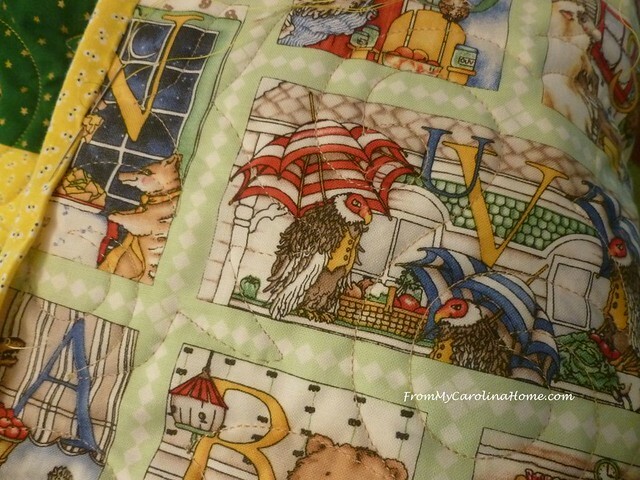 This quilt will give a child hours of loving cuddles and hours of playful fun learning. Such a fabulous donation also, Carole! I want to Thank You for sharing the way you help out your community in so many ways. It is always inspiring me to do that much more. 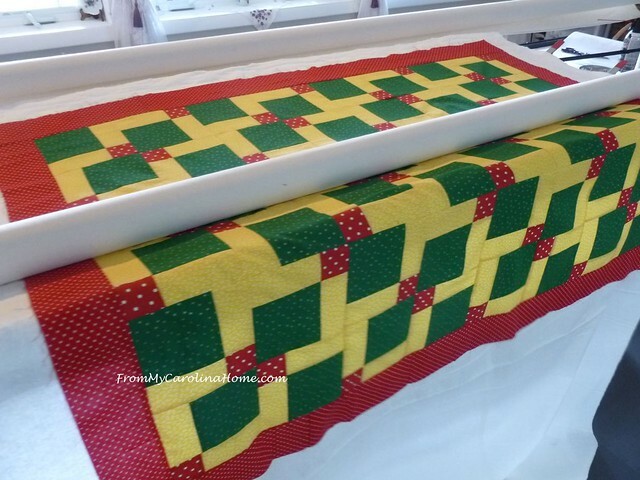 I hope that you win a ribbon on this quilt also. 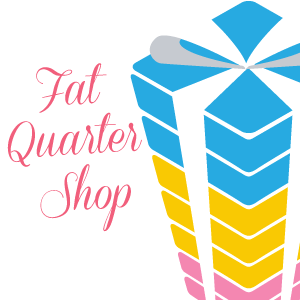 Would be neat to send the ribbon on with the quilt (yeah or neah) what are your thoughts? Have a spectacular day! How are you and your neighbors doing with rain and have you had any “mud” slides in or around your mountain area? I send my prayers. 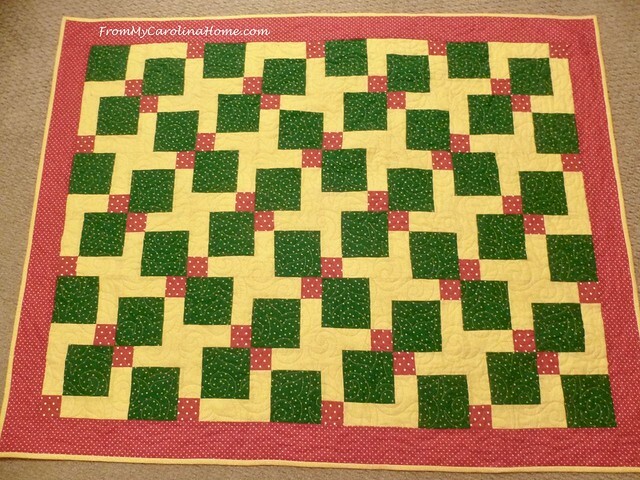 I DID spend the morning quilting! I didn’t get as far as you did, though. 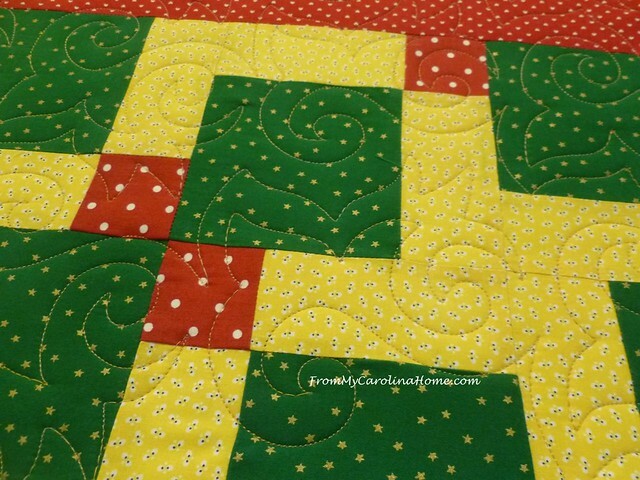 =) That’s a great quilt, and the fabric is easy to get lost in. I saw kettles in the K block. The elephant is on the edge of the grass, or the flagstones, whichever, and I had no idea what the N animals were, but it looks to me like they are having nachos in the night. =) A wonderful lullaby entry. 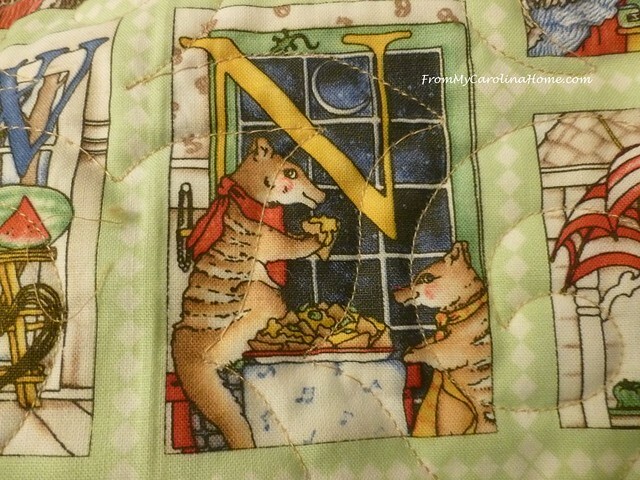 Beautiful quilt, you can spend ages looking at the animals..are the N animals numbats?? Love that print. 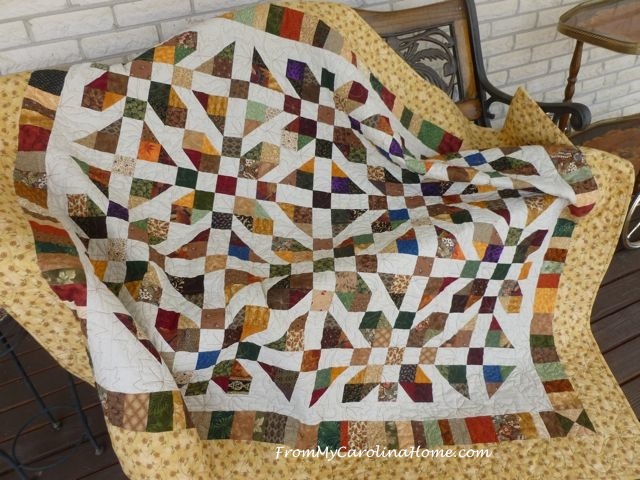 What a great quilt! 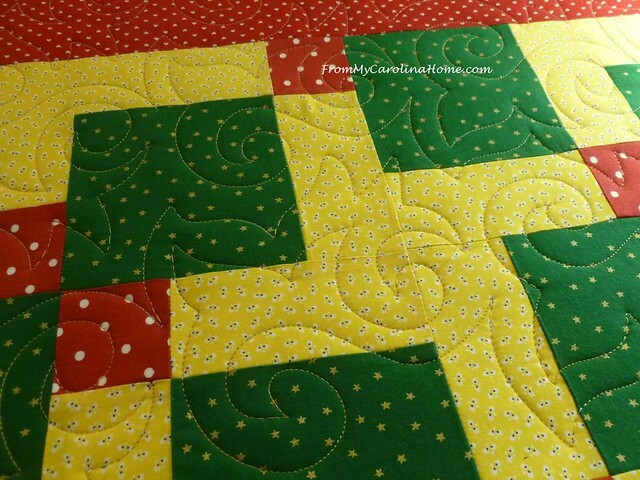 Beautiful job quilting. Lovely way to use the animal panel/fabric. It really is a fun one. Did anyone work out the numbats yet?